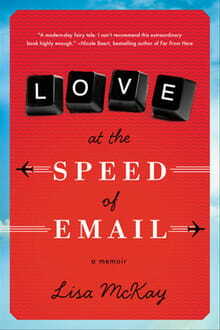 If Lisa McKay’s new book, Love at the Speed of Email, were a movie it would look something like a combination of Eat Pray Love and You’ve Got Mail, only with a faster Internet connection. Love at the Speed of Email is part memoir, part love affair. At 31, the still single McKay may be mourning her non-married status, but she has already achieved more than most of us will in a lifetime. She’s traveled the world, lived in numerous countries, maintained rich friendships with people around the globe and has what appears to be a glamorous and highly successful job as a psychologist who hosts global workshops on stress and trauma management for humanitarian relief workers. Not your typical nine to five. McKay’s nomadic lifestyle quickly leads to a web of complex inner musings she explores in her new novel. Not only does our witty, quirky heroine discover different cultures with each new city she visits, but with every passport stamp, she mines another facet of herself. She unfurls a running dialogue about life, love and faith in the 260-plus pages as she traverses the globe. Along her journey, she details relationships gone wrong and the one that went unexpectedly right. With the click of a mouse, McKay’s love story began. As an essay writer, she receives an email from relief worker Mike Wolfe in Papua New Guinea, and from there the two begin an email exchange that allows them to work out their innermost thoughts across the miles. Although they are on opposite ends of the globe, McKay and Wolfe develop a thoughtful long-distance relationship. The reader gets to eavesdrop on their correspondence as McKay and Wolfe discuss a myriad of intriguing topics, including religion. Both question why such a loving God would allow the extreme poverty, neglect, abuse and tragedy they have experienced first-hand throughout their careers all around the world. They explore universal questions of purpose and meaning. And while both are Christians and McKay talks frequently about being raised in church despite moving so often as a child, her view of God evolves as her journey progresses—shaped by the people she meets in foreign lands, her conversations with Mike and her constant struggle with the definition of “home.” The young, insecure writer at the beginning of the book is very different from the confident, mature author at the end. It’s in the midst of this very battle where McKay and Wolfe find common ground. They share an insatiable thirst for adventure and intrigue, which their careers afford them, yet they constantly fight off a nagging ache for stability and permanence. Does wanting one ideal mean you have to give up the other? Through relentless wrestling, McKay does a superb job of painting a beautifully artistic self-portrait. Her prose brims with insightful nuggets of wisdom as she flits from one continent to the next. Love at the Speed of Email far exceeds the status quo of Christian memoir writing, of which the pool is small. Although she intertwines her changing views on faith and how it plays out in her personal life, the novel is thankfully void of any Christianese, and instead, refreshingly recounts McKay’s faith in the context of her experience. Faith becomes a foundation for her story that appears raw and relatable. McKay’s life is often a whirlwind, but thankfully she lands long enough to put pen to paper savoring the things she’s learned and highlighting the questions that plague her. Although she seems to have more questions than answers, readers will relate to her authenticity and maybe even learn a little bit about themselves in the process. McKay proves that nothing shapes our stories more than life experience...and long-distance relationships do stand a fighting chance. Love at the Speed of Email is a must-read for anyone who seeks the thrill of adventure, heeds the call of distant lands and longs for a place to call home.